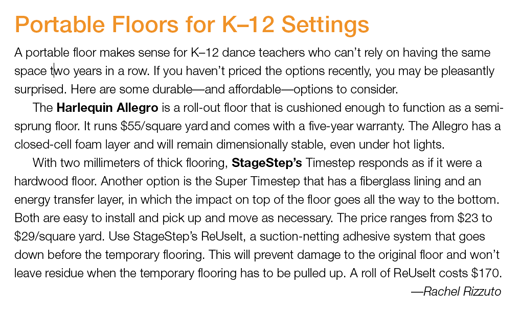 K–12 teachers go to the mat for proper floors. resilient surface, thanks to their teacher Lynn Reynolds. Teaching dance in a K–12 setting often means holding classes in hallways or cafeterias, sharing space with other student groups or dealing with ceilings that are too low for jumps. Even dedicated studio spaces often lack the kind of shock-absorbing floors that help prevent chronic injury. So, as a public school dance educator, what can you do? DT spoke with Baker and two other teachers who successfully secured funding for proper floors. After that school year, Reynolds talked to the principal, and when he heard about the physical stresses the tile/cement floor was causing, he agreed to fund a proper floor. Ten years later and with 150-plus students each year, Reynolds’ floor is still in good shape. She allows the custodians to mop it occasionally, and to dry-mop it regularly. Hannah Maria Hayes is a NYC freelance writer with an MA in dance education, American Ballet Theatre pedagogy emphasis, from New York University. What Exactly Does “Adequate” Mean? • Unobstructed space, providing a minimum of 2,400 square feet overall, and providing a minimum of 100 square feet per dancer. • Ceiling height of at least 15 feet. • Floors with the necessary resilience for dance (i.e., sprung or floating floor) and with surfacing appropriate to the nature of the dance activity. • Adequate fenestration, lighting, acoustical ambiance and ventilation. • Adequate mirrors and barres. • Adequate locker rooms, showers, drinking fountains, restrooms and access to first aid.